Usually, when you envision “meditation,” a person still in a crossed legged sitting position comes to mind. Tai Chi, on the other hand, is the meditation of moving. To save some unneeded confusion, it is pronounced, “tie chee.” Tai Chi involves not only the mind, but also the body as it originated as a martial art. One of the most popular movements in Tai Chi is shifting weight from leg to leg. It also involves lifting your arms, legs, and hands. It is this free and simple movement that eases stiff muscles and relieves joint pain. This movement also helps improve balance as you become more comfortable in shifting your weight. This can be especially helpful for elderly parents or grand-parents as it is known to lower the risk of deadly falls. The other benefits of Tai Chi include: increased calmness and awareness, better functioning digestive system, aided exchange of gases in the lungs, and massaged internal organs. Though Tai Chi can be practiced for just overall wellness, it can also be practiced to improve conditions with sleep, cardiovascular disease, hypertension, and osteoarthritis. In order to maximize the benefits of Tai Chi, you must also understand the philosophical meditative aspect of it. 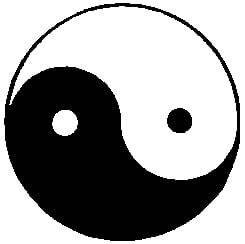 The philosophy of Tai Chi involves the ancient Chinese concept and symbol of the yin and yang. Though we are probably well aware of the round symbol in the West, the meaning may not be knows. Yin is personified as feminine in character, and involves what are commonly known as, “water qualities.” Water qualities involve coolness, darkness, downward movement, and stillness. Yang, on the other hand, is masculine in character. It contains the qualities of fire such as: heat, light, movement, and both upward and downward movement. In Chinese culture, the balance of the two opposing forces — the yin and yang — leads to a healthy life. The meditative aspect of Tai Chi comes as slow and easy as the Tai Chi movements themselves. Individuals must keep their mind both calm and alert as they focus on their inner well-being, and it can be achieved through deep-breathing techniques, as one takes deep, reflective breaths to release any kind of distracting tension and stress. Tai Chi is a wonderful way to not only find mental balance, but also physical balance. After all, a healthy mind is a healthy body.